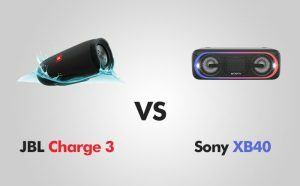 Today we have come up with the comparison between two popular set of speakers in the market: JBL Charge 3 vs Sony XB40. Infidelity in sound quality music is very unfair for a music lover who knows how it feels listening good quality music on high performance and efficiency music player and speakers. A big surround sound system can give you that out of the world experience at home but what about a party with friends in an out-house or during picnic or camping when you wish to dance and enjoy with good music. The above two speakers are designed for giving that extra edge to your music listening experience anywhere and everywhere. Now let us compare the two on the basis of their design, performance, efficiency and sound quality to find out which one is better out of the two. It is quite interesting to note that device which has a stereo speaker can easily deliver sound through independent channels in both the right and left side. This not only makes a richer sound but also enhances the music listening experience. Both JBL Charge 3 and Sony XB 40 have inbuilt stereo speakers to deliver rich sound and fine experience to the listener. Another important feature which adds to the convenience in use for the user is the presence of control panel on the device. Due to this control panel, a user can directly access the volume control and other variables without interacting with cable or the device with which the speakers are connected. Both JBL charge 3 and Sony XB40 has it on them. Another sign of a good speaker is the presence of an amplifier in the speaker. An amplifier is a device which takes a small signal and converts it into a bigger signal without any alteration in the sound wave. This, in turn, improves the sound quality and enables the speaker to be connected to any sound source. Both JBL Charge 3 and Sony XB40 can amplify the sound to a good degree to create an ecosystem of its own. Dimensions of JBL Charge 3 are 87 mm x 213 mm. Its weight is 800 grams. Dimensions of Sony XB40 are 100.1 mm x 279.9 mm. Its weight is 1.5 kg. When we talk about physical dimensions JBL charge 3 is smaller, lighter and much more portable than Sony XB40. It is 66.9 mm narrower, 13.1 mm shorter and 701.4 grams lighter than Sony XB40. You can easily pick up the speakers and enjoy dancing when you are partying with friends in an open venue like a farmhouse or jungle camp. The passive radiator is another important feature that allows the woofers to create deep tones similar to large speakers but in much smaller size. This passive radiator looks same as normal speaker from the front but at the back, all its guts are removed. Both JBL Charge 3 and Sony XB 40 have passive radiators in them to produce sonic output similar to what you would have got from large speaker cabinets. It is interesting to note that you can connect JBL charge 3 to up to 3 smartphones or tablets via Bluetooth. Its Bluetooth version is 4.1. On the other hand, you can easily stream music from Sony XB40 by connecting it to a device through Bluetooth, NFC, and LDAC. Its Bluetooth version is 4.2 which is 0.1 times newer than JBL Charge 3. It has a high power battery with up to 24 hours of battery life. Now you can listen to music all day and night or take the speakers with you to a night out without worrying about the battery of the speakers. It does not have a battery indicator and you will have to make sure to charge the batteries timely to prevent the speakers from dying out. Speaker driver is basically a transducer that converts the electrical energy into sound waves. More the number of drivers in a device better will be the sound quality of the speaker. Both JBL Charge 3 and Sony XB 40 have two speaker drivers in them. The detachable cable is a good feature for a speaker as it not only gives the liberty to the user to use any cable they wish but it also prevents the cable from breaking in case of accidental pulling. Instead, the cable comes off the speaker. It has detachable cable in it. On the other hand, Sony XB40 does not have a detachable cable in it. In the modern times of internet having WIFI connectivity is minimum that is expected out of a device. If a device has WIFI connectivity then it can be easily connected to any smartphone or tablet without requiring any cable. JBL Charge 3 does not have WIFI connectivity, on the other hand, Sony XB 40 can easily connect to other devices using WIFI connectivity. Jbl Charge 3 wins in this segment. While XB40 offers IPX5 certificate, which makes it splashproof, JBL Charge 3 has IPX7 and that makes it waterproof up to 1 meter for 30 minutes. PROS: Study / Compact / IPX7 waterproofing / 20 hours battery life / Good bass/ Can be used as power bank / JBL Connect. PROS: Cool LED effects / Clear sound / Good build quality / Excellent battery life (24 hours) / Splash-proof / NFC. CONS: Highs become muted. CONS: No Micro-USB charging / Proprietary charger / Poor speakerphone. Overall both JBL Charge 3 and Sony XB40 are good quality speakers giving high-level sound output. If you are looking for a speaker in economic range then JBL Charge 3 is a good option to be considered. On the other hand, Sony XB40 is a very good example of high-end technology, efficiency, and quality in the field of portable speakers. JBL Charge 3 is quite convenient to use through higher connectivity, Sony XB40 does full justice to music fidelity and listening experience.